GrillGrate, a manufacturer of unique, healthy grilling surfaces, recently launched a new ecommerce website powered by the award-winning Volusion ecommerce solution. 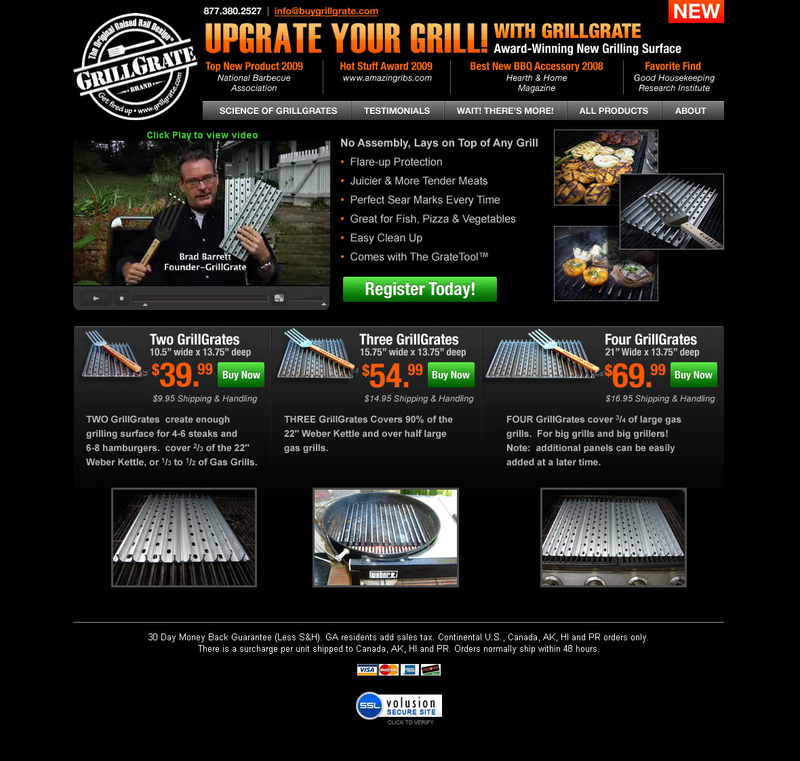 Following a week-long TV advertising campaign running on more than six national cable networks, the new website http://www.buygrillgrate.com handled significant web traffic increases, while the company processed and shipped orders three times faster than with the previous website. Seventy-five percent of the sales driven by the campaign were via the website, with the rest captured on inbound phone calls. The new site was able to convert an unprecedented 50% of the visitors from the campaign into sales. Additionally, the company has been approached by major brick and mortar retailers who want to carry GrillGrate products. Since the company’s start in January 2008, sales have grown every month and after the combination of the new site and the TV ad campaign, sales have skyrocketed. Brad Barrett had worked in new product development for much of his 30-year career trying to invent products that could be the next “Snuggie.” An avid griller, Brad had tinkered with grill accessories and eventually developed the GrillGrate, a unique surface for grills that makes cooking easier and healthier. Brad loved the way the GrillGrate allowed him to successfully grill a wider array of food without worrying about burns and flare-ups and the resulting product was healthier, juicier and better tasting. Brad knew he had a special product on his hands and quit his steady job to focus his time and efforts completely on GrillGrate. Additionally, GrillGrate planned to run a spring 2010 national direct-response ad campaign on major cable networks for the first time so it was crucial the site was professional looking and could handle a large amount of traffic. Brad started researching and testing ecommerce platforms. After spending a great deal of time comparing them, he figured the ultimate test was to experience the company’s customer service. “Volusion stood out because when I called in, I spoke with a live, knowledgeable person who really listened to what I was trying to accomplish,” said Barrett. Brad had a specific goal of building a landing page storefront that opened up into a larger, more traditional store so his needs were unique. “Most direct marketing companies build a one-dimensional buy site for a single, specific product. We wanted a real store. We recognized the need and opportunity for building a bigger store to give shoppers more options, and increase sales and build our brand,” said Barrett. After his first call to Volusion, Brad and his web developer built their site within a week, relying on the Volusion technical support as needed. “They’d jump into the store with us, not just tell us how to do something, but actually show us how to get things done and build an online store. We learned more quickly that way and saw first-hand the features and depth of the Volusion platform,” added Barrett. Customer Service – 24x7 live customer support allowed the marketing team to call for help at any time of day. Custom Design – GrillGrate’s web developer found the flexible Volusion platform easy to work with and customize for infomercial needs. Integrated CRM – Previously, order management was difficult, but with Volusion’s advanced ticketing system and all-in-one admin area, GrillGrate can manage the entire order process and customer experience from a single area of the store. Unlimited Scalability – The easily-scalable architecture with advanced load balancing and dynamic resourcing helped GrillGrate meet its demanding spikes in traffic garnered from national media coverage. Mission Critical Hosting – With 100 percent redundancy, virtualized hardware-independent systems, and continuous data backups with data clustering, Volusion offered GrillGrate the same technology infrastructure that powers systems for financial institutions. Stringent Security – Data is secured against theft or manipulation with integrated IP blocking, 24x7 surveillance and advanced encryption. PCI/CISP certification also ensures maximum protection of card-holder data. Volusion provides GrillGrate with a guarantee that its customers’ credit card information is securely collected, protected and stored. Email System and Newsletter Features – Built-in email system allows GrillGrate to easily build newsletters and communicate with customers in one central location. Volusion is a leader in ecommerce solutions for online businesses. Over the last ten years, thousands of companies have used Volusion to succeed online, including market leaders such as Disney, Motorola, Chicago Tribune, Michigan State University and Crutchfield. For more information about Volusion, please visit http://www.volusion.com. The privately held company is based in Cartersville, Georgia. GrillGrates are manufactured and coated in the U.S. The GrateTool™ is imported. Patents are pending.